Looking through the official transcript of the final spring football press conference on Tuesday, I imagined coach Bill Snyder intoning the words as I read them, and it was easy to envision, mainly because he has said exactly the same words an incalculable number of times before – and likely will again. To longtime K-Staters, I believe the following carefully measured phrases will sound exceedingly familiar. 1. First of all, I admire Snyder, so my reaction to his repeated speeches for the half-hour Tuesday press conferences is amusement steeped in respect for him as a coach and as an individual. I find Snyder to be a great person, not to mention a much wittier one than is reflected by most of the quotes that make the papers. Obviously he does a great job coaching. I would wager most people have given up any attempts to second-guess him after last year’s unprecedented 10-win run to the Cotton Bowl. He knows what he is doing, quite clearly. 3. The man has been coaching football since 1966. The central tenets of football – and Snyder’s long-held philosophy of hard work, improvement and consistency – do not change, so I guess one can hardly expect too many surprises from one week to the next. Still, you might say it appears that Snyder works hard to steadily improve the consistency of his responses to the media. 4. I honestly do not know if I fault the coach for keeping what seems like any and all details close to the vest. From a coach’s perspective, putting a winning team on the field is the end goal, and depth or freshness of a story about the team really has no bearing on that measure, so why let more information go than is absolutely necessary? This is how I will conclude: for all the yawn-inducing press conferences he conducts, the values Snyder endorses – the work ethic, the consistency, the improvement – are perhaps best embodied in him personally. He often jokes about how he rarely sees more of Manhattan than the football complex; he does not change from season to season – or even from decade to decade; and he legitimately is unsatisfied with a certain level of performance when he deems more achievement to be a possibility. Really, what more could you want in a coach? On Tuesday coach Bill Snyder indicated a possible change to the typical format of the Kansas State’s Purple and White scrimmage. Instead of watching the No. 1 offense rack up eight touchdowns on the No. 2 defense over the course of an hour, a reality that last season prompted a reversal of the score at halftime, fans may get to see the first-string players on offense and defense pitted against each other during this season’s pre-season glimpse of the Kansas State team that went 10-3 in 2011. Snyder said he will not decide until Thursday whether he will stay with the old system of having the first-string offensive and defensive players on the same team or whether he will put the players of highest caliber against each other. Thinking back to last year’s spring game, I daydream with great expectations about a game of No. 1s versus No. 1s. The headline summarizing the last publicized scrimmage is misleading: “Purple rallies to post 38-37 win at annual spring game.” That score pertained to the pretend world in which the teams swap scores at the half. In reality, the first string dominated the second string 59-16. Media, fans and players alike would bask in the substantial gain in validity the spring game would have if the format changed from ones-versus-twos to ones-versus-ones. I sincerely hope that will be the case on Saturday. 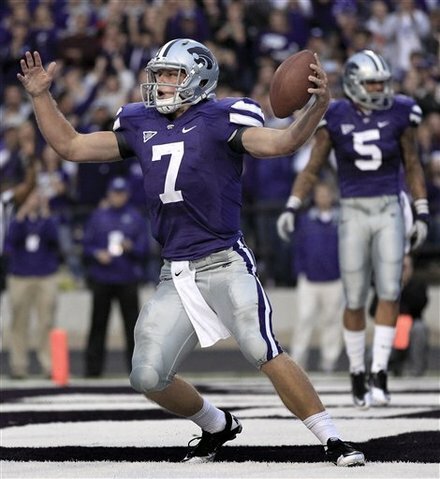 If not, well, at least we might see another 358-yard, 5-touchdown performance by quarterback Collin Klein. With under 3 minutes to play in the ball game and Texas driving, Kansas State had not gotten a sack. After three consecutive incompletions by Case McCoy, the Wildcats’ Adam Davis picked the best possible time to put the quarterback on the ground. Not long after, Kansas State secured a 17-13 victory, its fourth consecutive win against the Longhorns. Though the Wildcats amassed only 121 yards of offense compared to the Longhorns’ 310, they came out on top to move to 9-2 on the season. The game began as a snoozer. In fact, each team only had a field goal until 9 seconds remained in the first half. Kansas State struck first with a field goal – all it could manage even having just 16 yards to go after an interception by Emmanuel Lamur with 11:06 to go in the first quarter gave the Wildcats a super-short field. A few possessions later, Texas took advantage of its own fairly decent field position by converting on a 38-yard field goal. The game remained tied 3-3 until the final seconds of the half. On a drive that included an 11-yard catch by Chris Harper and a 24-yard zinger to Sheldon Smith on the sideline, Collin Klein threw a strike to Harper to put the Wildcats up 10-3 going into halftime. Texas’ first drive of the second half gave way to another interception by the Wildcats, this one by Ty Zimmerman, who picked off the Longhorns twice in last season’s game. 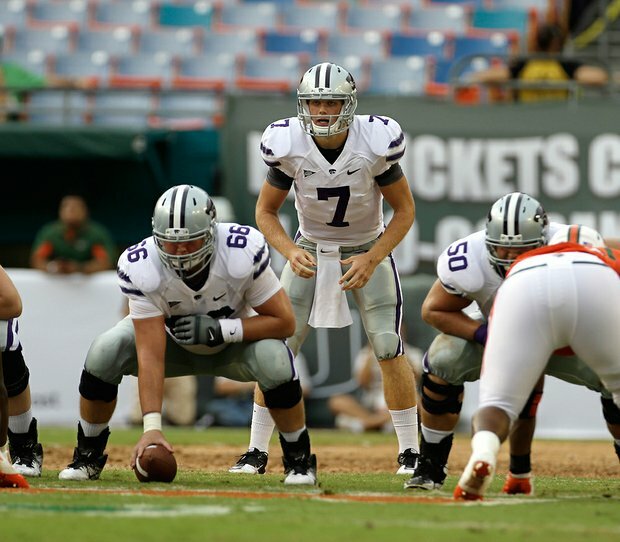 The ensuing possession for Kansas State ended – predictably – with a touchdown rush by Klein. This put Kansas State up 17-3 with 6:59 to go in the third quarter. The Longhorns answered with a long drive that culminated in a 36-yard touchdown pass from McCoy to Blaine Irby. This put Texas within a touchdown of Kansas State with 3:43 to play in the third quarter. Leading 17-10, the Wildcats’ offense stalled. The Longhorns pulled within four points after getting a field goal with 4:27 left in the game. Leading Texas 17-13, Kansas State went three and out. The Longhorns turned it over on downs, and even though the Wildcats had to punt on their next possession, Texas ran out of time. In the first seven minutes of the ball game, it appeared all the critics might be right about Kansas State. At the end, they were … at least about this particular game. The scoreboard read 58-17 Oklahoma. It was a devastating blow to the previously undefeated Wildcats. On homecoming weekend in Manhattan, the defense that had been so highly regarded took a horrible beating. The Sooners’ offense ran rampant, gaining 690 yards. 520 of those came through the air, the worst aerial attack ever by an opponent at Bill Snyder Family Stadium. While the skill and speed of No. 11 Oklahoma did not shock the Wildcats, they certainly did not expect the outcome they got on Saturday. Largely thanks to two interceptions by Nigel Malone in the first half, the No. 10 Wildcats trailed just 23-16 going into the locker room at halftime. As the second half progressed, it became clear who made better halftime adjustments. In the final 30 minutes, the Wildcats did not score; the Sooners scored five touchdowns. Kansas State recorded just 32 yards of offense in the second half. Oklahoma got more than 10 times that number – 378, to be exact. While those statistics make the home team defense look pretty awful, coach Bill Snyder said made it clear that it was a team loss. Interestingly enough, it did not start out that way. To begin the game, Oklahoma marched down the field on consecutive possessions while Kansas State answered with three-and-outs. The Sooners took a 14-0 lead. A minute later, the Wildcats took advantage of the Sooners kick out of bounds. They got a field. It was 14-3. It was a modest beginning for the Kansas State offense, to be sure. 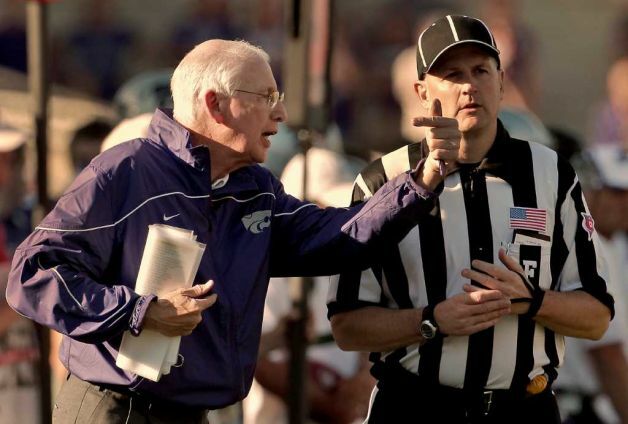 On the first play of the second quarter, the Wildcats committed a false start, the kind of attention-to-detail penalty that coach Bill Snyder cannot stand. On the second play of that quarter, quarterback Collin Klein weaved through the Oklahoma defense for a 42-yard touchdown rush. All of a sudden, it was 14-10 Oklahoma. On the Sooners’ next possession, cornerback Nigel Malone picked off Oklahoma quarterback Landry Jones, setting the Wildcats up for – wait for it – a 2-yard touchdown plunge by Klein. Just like that, Kansas State led Oklahoma 17-14. After giving up 17 consecutive points, the Sooners responded promptly with a touchdown of their own. They only went up by three points, however, as defensive tackle Raphael Guidry blocked the extra point. It was his third such play of the season after blocking two Texas Tech field goals a couple weeks earlier. With the Sooners leading 20-17, the Wildcats sustained a nice long drive only to miss a 25-yard field goal. On Oklahoma’s ensuing drive, Jones threw another interception. It was Malone again, good for his sixth pick of the season. Unfortunately for Kansas State, that possession yielded nothing after running back John Hubert fumbled and Oklahoma recovered. Only able to get a field goal from the possession, the Sooners went into the locker room with a six-point advantage. Though the Wildcats did a decent job containing the Sooners in the first half and moving the ball themselves, they could not do either in the second half. With Oklahoma State next on the dock, though, the Wildcats cannot dwell on this debacle. That sentiment is unanimous. “We’ve just got to come together on Monday and bounce back,” said cornerback David Garrett. Since the Kansas State coach only takes time to eat twice a day, it’s hard to imagine he’ll be spending much time celebrating his birthday today, particularly with a game against a deceptively capable 2-2 Missouri team happening tomorrow. On Tuesday, he acknowledged this. With a wry laugh, he said that Friday would consist of meetings … nothing birthday-related. Still, even if his birthday doesn’t excite him very much, you know other people want to tease him and congratulate him about it. 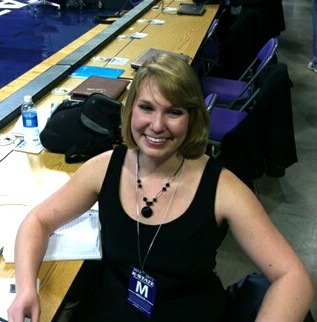 That got me thinking – What would be a good present for Bill Snyder? I started pondering all the different aspects of the game and life – because most of the principles he endorses are tied to both – that seem to make him happiest: family, constant improvement, discipline, and winning. While he doesn’t talk about that last one in such passionate terms as the others, I noticed that on Tuesday he wore a bright purple tie instead of the demure, pale yellow one he usually sports for press conferences. With a bit of poetic license, I interpret that as his optimism/excitement about the success this season’s team has had. A win in which the Wildcats 1) get more yardage than they’ve amassed against comparable opponents this season while giving up less, 2) commit no penalties or turnovers because everyone is in the right place at the right time, and 3) display tremendous morale and support for each other throughout the game. Kansas State fans everywhere breathed a collective sigh of relief when the Wildcats dismissed Kent State 37-0 on Saturday night. It was a reassuring victory (despite being aided by 136 yards of Kent State penalties) after the team had to scrape up a fourth quarter comeback to vanquish Eastern Kentucky 10-7 two weeks earlier. When you break down this game, however, it certainly was not all good, and the Wildcats have work ahead before they go to Miami for their third and final (and very easily the most difficult) nonconference game of the regular season. Certainly, having mobile quarterback Collin Klein run the ball 19 times proved to be effective against Kent State, but that is probably not a strategy anyone can expect to be successful long term. If Kansas State has to use him that much on a regular basis, the most likely outcome is that he gets hurt. Now, head coach Bill Snyder said that using Klein’s legs that much is not the plan going forward; he compared last night’s game to last year’s game against Texas, in which running Klein just worked, so they kept doing it. None of the three running backs (John Hubert, Robert Rose, Angelo Pease) got excessive yardage; not one of them had more than 30 yards. However, the offensive line did look better than it did in the previous game, and the overall blocking seemed improved, as evidenced by how much Klein was able to run. Klein appeared to be getting more comfortable with the receivers this week, although Snyder said the play calling did not give him as many opportunities to work with. One aspect of Klein’s play that I noticed and appreciated was that after missing an endzone-bound Brodrick Smith on a long pass down the sideline, Klein went right back to him and hit him for a 15-yard strike on the very next play. Klein’s passing numbers weren’t stellar, as he completed 9 of 18 passes for 74 yards, but they were solid. Sammuel Lamur also saw time at the quarterback spot, and he completed four of six passes for 42 yards. Across the board, many onlookers were impressed by how he threw the ball, and I agree that there seemed to be a certain ease and smoothness to his passing motion. Last but not least, we can’t overlook the fact the Wildcats only scored a field goal in the second half. Part of that can be attributed to putting some of the No. 2 and No. 3 players on the field to get them game experience, but Snyder still was less than thrilled by that. If you score 34 points against a Big 12 team and none in the second half, you may well lose the game. There is not much to complain about when a unit gives a team its first shutout in five seasons. Even when Kent State spent what seemed like an eternity in the red zone, the Kansas State defense held in impressive fashion, and Snyder mentioned he was proud of the players for that. Not to put a damper on the shutout, but it did come against an offense ranked 119th out of 120 FBS teams. Next week again Miami will be a much more telling test. Tyler Lockett muffed (but then recovered) a punt return, but other than that the team seemed fairly solid. Anthony Cantele hit all his field goals and extra points, and David Garrett and Tramaine Thompson got some decent returns. For this unit, the second impression was much, much better than the first.